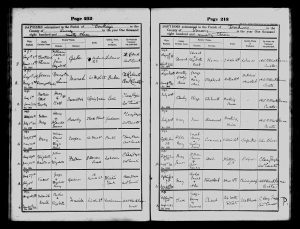 Percy James Heal was born in Wathen Road, Dorking on the 9th August 1893 to William Thomas and Alice Frances Heal, and was baptised on 6th September 1893, at St. Martin’s Church, Dorking. Father William, a photographer, was originally from Devon, then went to Southampton where he married Alice and they had their eldest daughter. The family then came to Dorking around 1888. 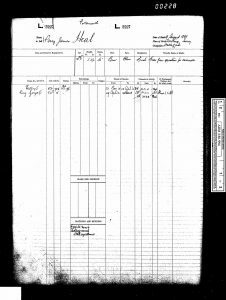 The 1901 Census shows the family still living in Wathen Road, Dorking. The family has now grown to include nine brothers and sisters, including Frederick who would later lose his life in the First War World also. Percy was at school. 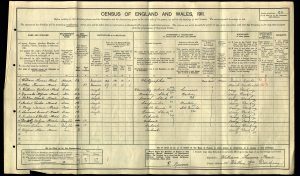 The 1911 Census shows the family still living in Wathen Road, Dorking and the family had grown extensively to include another two children. Percy was now working as a stable lad. In the latter part of 1911 Percy joined the Navy serving from 23 November 1911 until 29th April 1913, firstly serving on Victory I and then on the King George V.
On the outbreak of war Percy joined the army, surprisingly he did not return to the Navy. 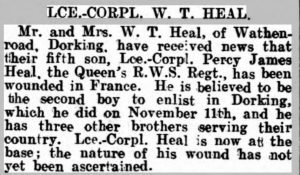 Mr. and Mrs. W. T. Heal, of Wathen Road, Dorking, have received news that their fifth son, Lce-Corpl. Percy James Heal, the Queen’s R.W.S. Regt. has been wounded in France. He is believed to be the second boy to enlist in Dorking, which he did on November 11th 1914, and he has three other brothers serving their country. Lce-Corpl. Heal is now at the base; the nature of his wound has not yet been ascertained. Percy was killed in action near Arras on the 29th November 1916 aged 23. He is buried in Wailly Orchard Cemetery. Mr. and Mrs. W. T. Heal , Wathen Rd, Dorking, have received the sad news of the death in action of their fifth son, Corpl Percy James Heal, of the Queen’s Royal West Surrey Regt. He joined the Army during the week following the outbreak of warm at which time he was working for Messrs. Colls and Sons. He had previously served two years in the Navy. He was an old British School boy, and at the time of his deathwas 23 years of age. 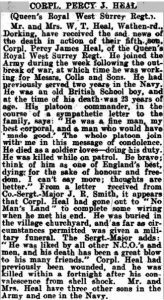 His platoon commander, in the course of a sympathetic letter to the family says “He was a fine man, my best corporal, and a man who would have ‘made good.’ The whole of the platoon join with me in this letter of condolence. He died as a soldier loves – doing his duty. He was killed while on patrol. Be brave; think of him as one of England’s best dying; for the sake of honour and freedom. I can’t say more; thoughts are better.” From a letter received from Co. Sergt. Major J. R. Smith, it appears that Corpl. Heal had gone out to “No Man’s Land” to complete some wiring when he met his end. He was buried in the village churchyard, and as far as circumstances permitted was given a military funeral. The Sergt. Major adds : “He was liked by all other N.C.O’s and men, and his death has been a great blow to his many friends.” Corpl. Heal had previously been wounded, and he was killed within a fortnight after his convalescence from shell shock. Mr. and Mrs. Heal have three other sons in the Army and one in the Navy.